Let's actually think INSIDE the box! We've created an exclusive video for Practice 5 from the Creative Handbook, you can find it here. And if you don't have your copy of the Creative Handbook yet, download it free here. Creating art, or breakthrough ideas for that matter, is intimidating enough without putting pressure on yourself to make something completely original and unrelated to anything that has come before. We're often told to "think outside the box" to create breakthrough ideas, but Practice 5 is all about turning that advice on its head. In this practice we challenge you to take what is already in front of you and shape it into something new. Like a wood carver patiently chiseling away until a form emerges, we too can "create through elimination." 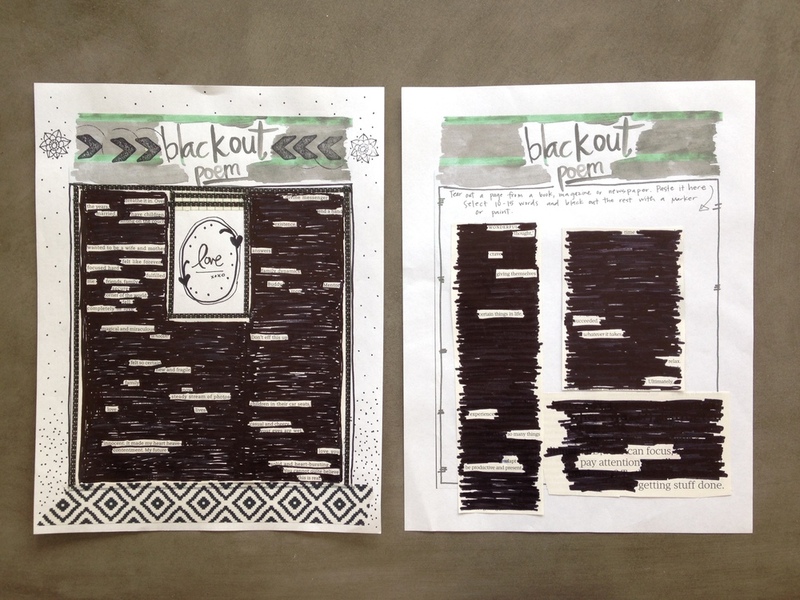 Inspired by Austin Kleon's "Blackout Poems", in this Practice we start out with a page ripped from a magazine and then create a poem by blacking out words rather than writing them. This leads to an unexpectedly emotional experience for both Jamie and me, so be sure to watch the video here. Jamie's poem on the left, mine on the right. fell completely in love, magical and miraculous, Whoosh! WONDERFUL thought crave giving themselves certain things in life. relax. Ultimately can focus,pay attention, getting stuff done. We hope you've filled in your pages and made the book your own. Thanks for joining us on this journey! We hope that you'll come back to the handbook again and again as you seek inspiration and breakthrough. We also hope you'll share it with your friends. Use #amytangerinehandbook if you are comfortable sharing your work on Instagram! Next week I'm announcing my newest project with Jamie Waters. I can't wait to share it with you. Here's a hint, be sure to subscribe to my YouTube channel if you haven't done so already.